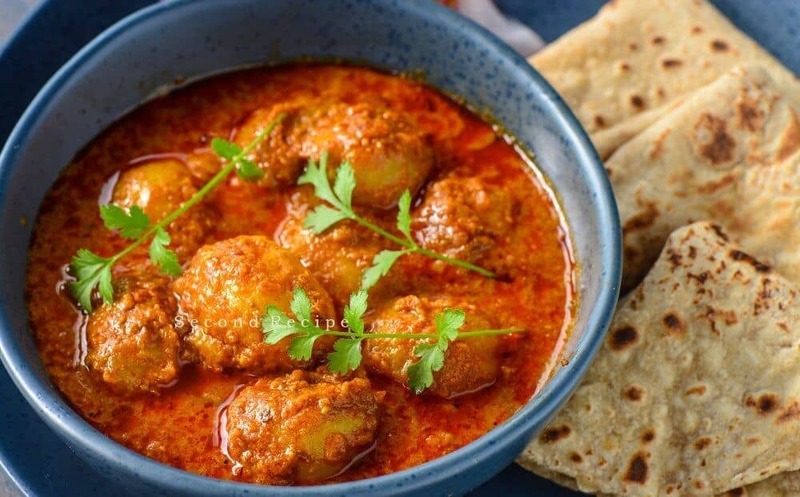 Dum aloo is a traditional curry in Kashmiri Pandit cuisine. You can recreate the Kashmiri magic in the ambiance of the house even if you cannot visit it as much as you would like to. Aloo or potato may be a foreign import to India,but we use it in many different ways.You will find so many variations in curries with one common ingredient potato.Stuff,bake,fry,curry and enjoy it just the way you like.You can never go wrong with potatoes.All age groups love it be it children or aged. Each of us has our own favorite potato dish. Steam baby potatoes till slightly soft and prick them. Saute them in little oil along with salt.Keep it aside. Heat oil,add ginger-garlic paste and cumin seeds. Add potatoes with 1.5 cup water,simmer for 10-15 minutes until potatoes cookef. Serve hot with roti or poori. Click here to read more curry recipes.